April 16, 2013 – 9:06 A.M.
Eggtc. is a Kansas City brunchery and coffee bar, serving both Shawnee and Kansas City, Missouri. 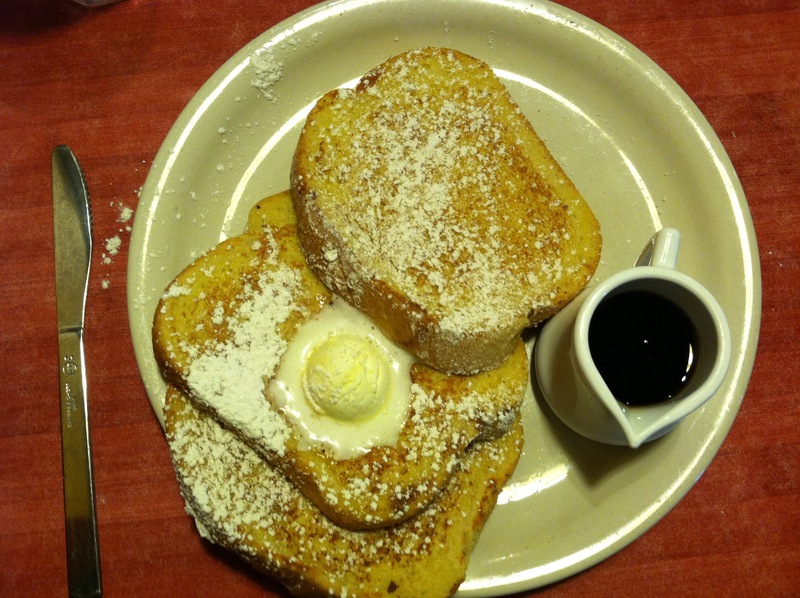 Both locations offer a wide selection of breakfast and lunch items, though the menu does lean more toward breakfast. Eggtc. offers one of the widest drink menus we’ve ‘clogged, with a full coffee bar at your disposal. More info, as well as their full menu, can be found on their website. Be sure to check out their Facebook and Twitter pages as well. We visited the Kansas City, MO branch, located in South Plaza. Location/Environment: The KCMO location is off the beaten path in Plaza terms. It’s a little bit away from the actual Plaza district, but close enough to be convenient. At busier times, parking could be an issue, but we found no problems. The dining rooms are spacious. It’s a more casual dining experience, as opposed to intimate. It’s a good location to read an early morning paper or catch up on Sportscenter on one of their numerous TVs. Service: Service was of high quality. Our waitress was very friendly. She offered recommendations and made sure we were taken care of repeatedly. Our order was received quickly. Our coffee was filled and she didn’t make fun of us. It’s hard to judge service when you have easy orders and you visit at a slower time. That being said, service was superb. Menu/Selection: The menu does lean more toward the breakfast side than lunch, as there are many more options for breakfast. As pancloggers, this is a plus. Most places try to balance the two meals for more variety. This could be a negative for breakfast haters, or “breaters,” but we only see it as a plus. The more griddle options, the better. Note: If you have Foursquare, be sure to check in. First timers receive a free beverage (coffee, iced tea, etc.)! Eggs are cool, right!? You can make them into so many different varieties. You can make scrambled, sunny-side up, over-easy, over-medium, over-hard, and poached. You can make them into tasty omelettes, frittatas, and even quiches! Shout out to the chickens that make tasty fake baby holders. I chose to have over-easy eggs with my classico meal. The over-easy is a good choice if you have a starch on your plate that you want to enrich with yolk. I yolked all over my potatoes. This made a tasty mess. Lightly seasoned country potatoes make any meal better. I almost exclusively choose bacon over sausage. 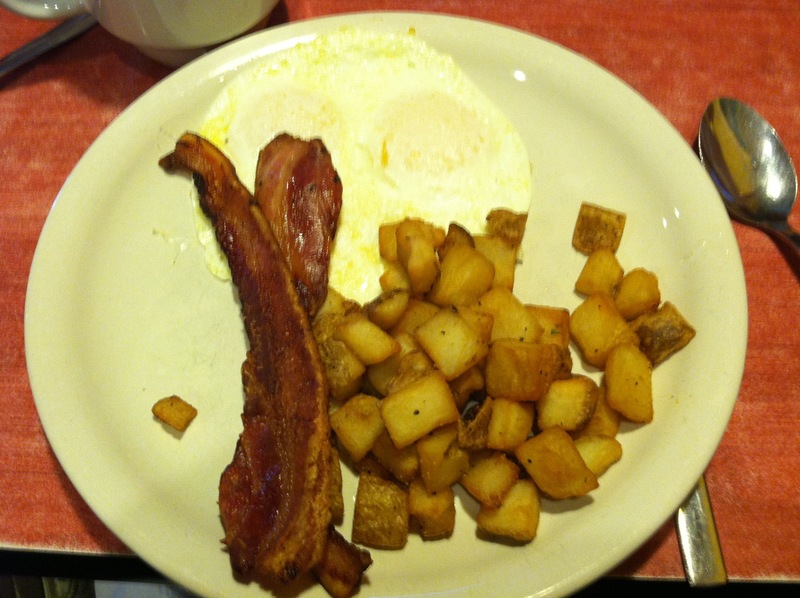 Bacon is just a perfect complement to most breakfasts. The saltiness of the bacon can give your taste buds a much needed flavor break. Waffles! Waffles are known for their amazing ability to capture the intensity of all the ingredients of the waffle in their FLAVOR POCKETS! 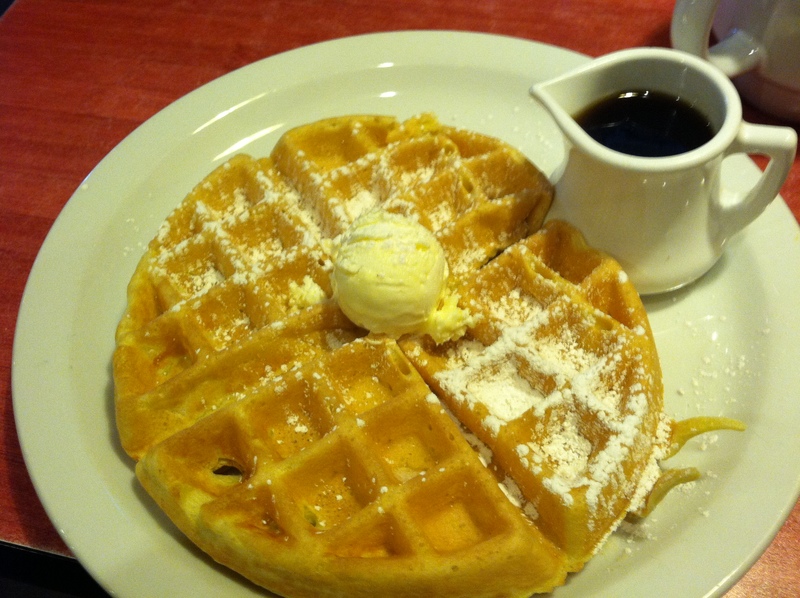 This waffle had a hearty dollop of butter, and a scattering of powdered sugar. Along with the syrup, the flavors made your mouth a utopia of enjoyment. The pre-portioned syrup was perfect amount for my waffle. This surprised me because most pre-portions of syrup tend to come up short. I am very happy to say that this waffle was just the perfect density. It was not too tough yet it wasn’t too mushy, I only needed a fork to cut it. Which is what I like. I am a simple man, I am no fan of using two utensils at the same time. At $7.69, it’s a fair price for all this food. I want to say that Eggtc. gives you the option of infused honey as a substitute of syrup. I did not try the infused honey this time, but I am certain I will try it on my next visit. Sourdough french toast is my go-to in many ways. Sourdough is my favorite bread, french toast is my favorite breakfast food, ergo, sourdough french toast is the best of both worlds. 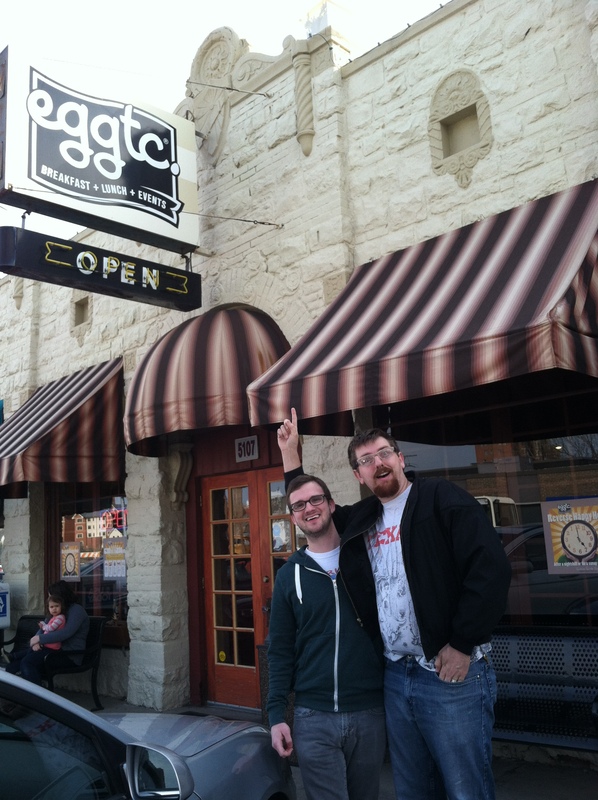 And Eggtc.’s did not disappoint. The bread was the perfect thickness, just enough sponginess to absorb the syrup and butter. It was a rich and buttery mix, enough to not be a complete overload when added to the powdered sugar. The syrup was portioned, which dear readers, you know I’m not a fan of, but the portioned amount was completely enough! No problems there. Both Jared and I took advantage of their Foursquare special: free coffee! Eggtc. had very strong silverware. We’ve run into some weak utensils in the past, and it’s never a fun endeavor. The meal was $4.69 (with no sides), and with the addition of free coffee, it’s a hard price to beat for a quality breakfast. Price: The prices are equivalent to what you would find at any other brunchery in the Kansas City area. When you include the glorious deal of the Foursquare special, Eggtc. won’t make your wallet cry. Overall: We thoroughly enjoyed our meal and the service. We are already planning a 2nd visit to try more goodies from their full service coffee bar and their other menu options. The Pancloggers would like to thank Brent Morgan for his fine recommendation. Follow him on Twitter!